권유림, 전해옥,(2013).중년여성의 지각된 건강상태, 자아존중감, 가족기능이 노화에 대한 기대에 미치는 영향.대한간호과학회지,43(2),176-184. Purpose: The purpose of this study was to investigate expectations regarding aging by middle-aged women in the community, and identify factors contributing to their expectations about aging. 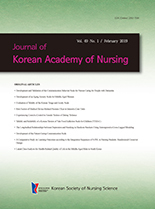 Methods: Participants in the survey for this study were 303 middle-aged women from community health centers and religious facilities in Seoul, Gyeonggi Province, and Chungcheongbuk Province. Data were collected from March 2 to April 17, 2012 using self-report structured questionnaires. The instruments were the Health Perceptions, Rosenberg Self-esteem Scale (RSES), Family APGAR, Expectations Regarding Aging (ERA-12). The data were analyzed using t-test, one-way ANOVA, Scheffe test, Pearson correlation coefficients and hierarchical multiple regression with IBM SPSS/WIN 20.0 program. Results: Perceived health status (ß=0.16, p=.009) and self-esteem (ß=0.20, p=.001) of middle-aged women were identified as significant predictors of expectations regarding aging, after adjusting for age, education, occupation, monthly income and menstrual status. Conclusion: These results suggest that nurses should make an effort to improve expectations about aging among middle-aged women. Ultimately, community health programs for middle aged women need to be developed to achieve successful aging.